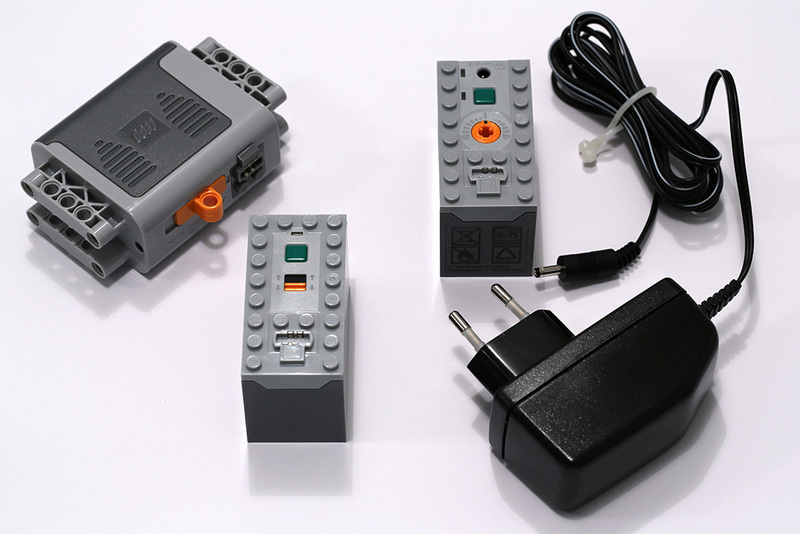 I briefly took a look at LEGO’s Power Functions electronics platform last year (see for box photos). With LEGO Mindstorms EV3 just around the corner, and the project which my Power Functions exploration is associated with involving the second greatest LEGO electronics feat in history (the 1980s LEGO Trains), I think LEGO electronics is topical. That said, Power Functions itself is not compatible with either Mindstorms (EV3 or otherwise), nor with the 1980s LEGO Trains electronics or any other old LEGO electronics system, such as the 9V or RC Trains. Power Functions (PF) is nevertheless quite a versatile electronics system that spans everything from Technic to Racers to Creator to Star Wars to LEGO City. It reminds me a little of the 1980s LEGO electronics that had quite a bit of interoperability between the 4.5V and 12V offerings in various themes. Basically PF offers a bunch of motors, different battery configurations, remote control and lighting – plus the wiring and infrared to tie it all together. Above (from left): PF battery boxes – 8881 AA battery box (six AA batteries), 88000 AAA battery box (six AAA batteries), 8878 rechargeable battery and its 8887 10V transformer. All can power 2 XL motors or 4 M motors at one time, but only the rechargeable battery box has a built-in speed dial (others are simply forwards/backwards/off, until a remote control unit is attached). Power is just one thing Power Functions provides. Where things get really interesting are the different motors. 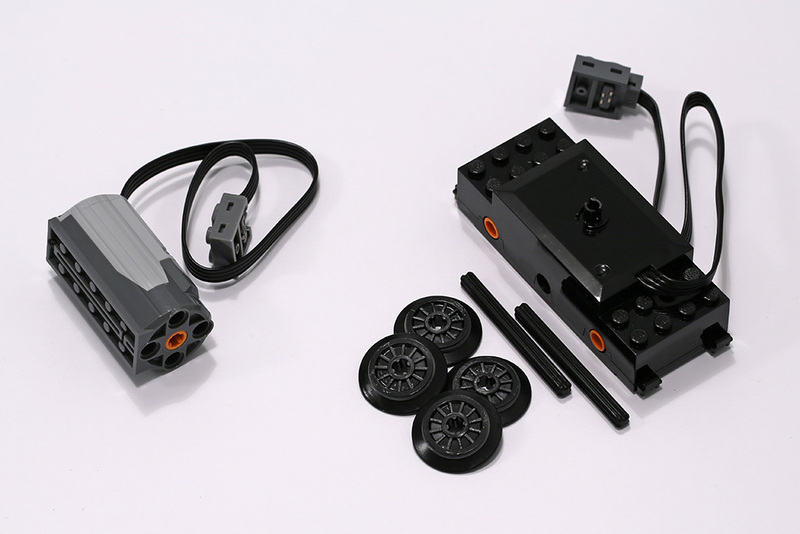 Over at Eurobricks, user hoeij pointed out this great summary of LEGO Technic and Power Functions motor characteristics. I won’t even try to repeat it here, go browse the link. Safe to say, selecting the right kind of motor can greatly affect your design. For our purposes here, it is important to note that in addition to traditional Technic motors, there is also a PF train motor. Above: I have two kinds of PF motors, but there are many more on the market. On the left, 8883 M motor (M stands for medium sized) and on the right, 88002 train motor. Final part of the PF puzzle is lighting and control. You can exert rudimentary control from the battery boxes themselves. There is also a wired controller you can add to your design for better usability. However, for the most versatile control you can add up to four different IR receivers (each with their own channel) and control them through an infrared remote controller. There are a couple of different infrared receivers and remote controllers as well as various cabling options to complicate things, but basically all control the power motors and lighting pieces receive. P.S. TLG has released a few stand-alone components (within sets) that are sometimes associated with the Power Functions discussion. These include the 61100 Windup Motor, used in e.g. 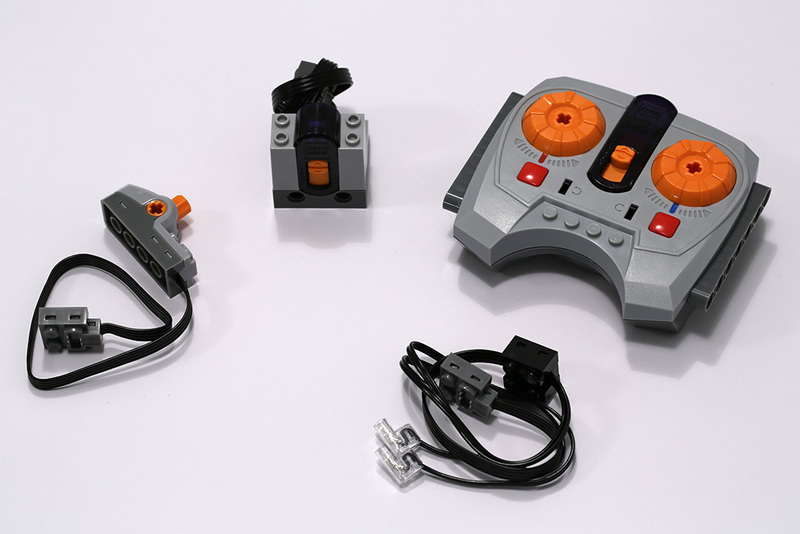 LEGO helicopters, and 55206 Electric Sound Brick, used as a door-bell – there are also carousel sound, space sound and other versions of this brick. However, neither use the PF battery boxes or remote control (or are PF per se), but instead are operated with built-in batteries and switches.